If the icy surface of Pluto's giant moon Charon is cracked, analysis of the fractures could reveal if its interior was warm, perhaps warm enough to have maintained a subterranean ocean of liquid water, according to a new NASA-funded study. 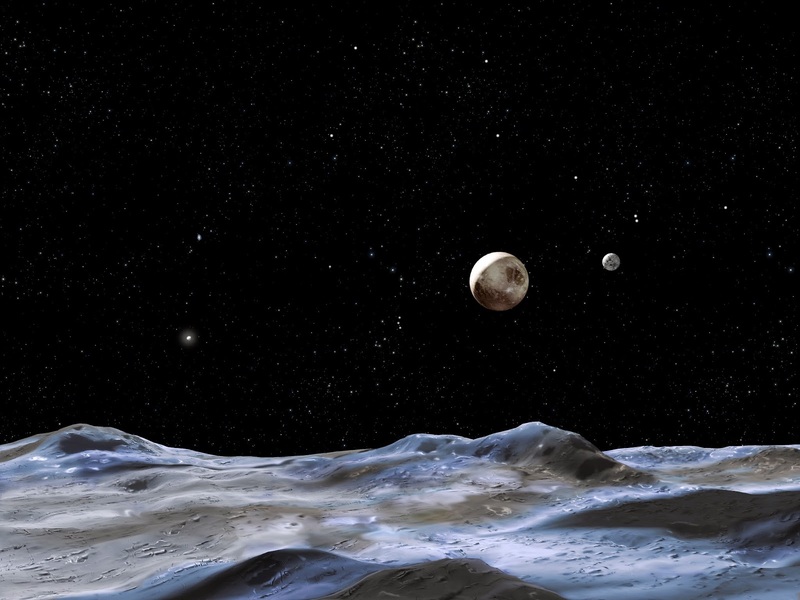 This artist concept shows Pluto and some of its moons, as viewed from the surface of one of the moons. Pluto is the large disk at center. Charon is the smaller disk to the right. Pluto is an extremely distant world, orbiting the sun more than 29 times farther than Earth. With a surface temperature estimated to be about 380 degrees below zero Fahrenheit (around minus 229 degrees Celsius), the environment at Pluto is far too cold to allow liquid water on its surface. Pluto's moons are in the same frigid environment. Pluto's remoteness and small size make it difficult to observe, but in July of 2015, NASA's New Horizons spacecraft will be the first to visit Pluto and Charon, and will provide the most detailed observations to date. "Our model predicts different fracture patterns on the surface of Charon depending on the thickness of its surface ice, the structure of the moon's interior and how easily it deforms, and how its orbit evolved," said Alyssa Rhoden of NASA's Goddard Space Flight Center in Greenbelt, Maryland. "By comparing the actual New Horizons observations of Charon to the various predictions, we can see what fits best and discover if Charon could have had a subsurface ocean in its past, driven by high eccentricity." Rhoden is lead author of a paper on this research now available online in the journal Icarus. Some moons around the gas giant planets in the outer solar system have cracked surfaces with evidence for ocean interiors – Jupiter's moon Europa and Saturn's moon Enceladus are two examples. This is a mosaic of images showing cracks in Saturn's moon Enceladus taken by the Cassini spacecraft during its close flyby on March 9 and July 14, 2005. As Europa and Enceladus move in their orbits, a gravitational tug-of-war between their respective parent planets and neighboring moons keeps their orbits from becoming circular. Instead, these moons have eccentric (slightly oval-shaped) orbits, which raise daily tides that flex the interior and stress the surface. It is thought that tidal heating has extended the lifetimes of subsurface oceans on Europa and Enceladus by keeping their interiors warm. Two views from NASA's Galileo mission of Jupiter's moon Europa. 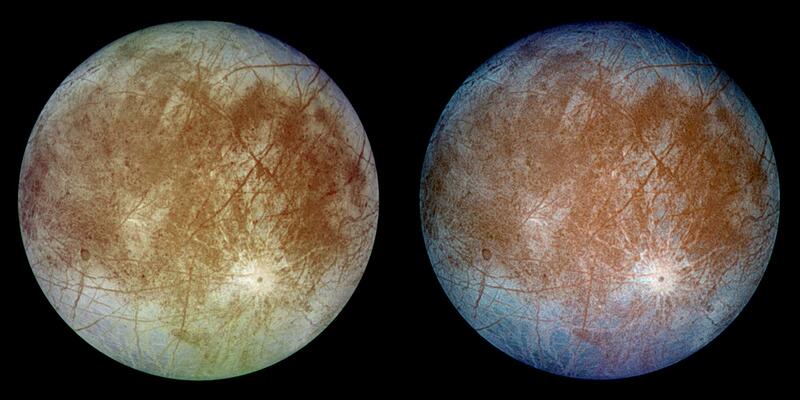 The left image shows the approximate natural color appearance of Europa. The right image is a false-color composite of violet, green and infrared images to enhance color differences in the predominantly water-ice crust of Europa. In Charon's case, this study finds that a past high eccentricity could have generated large tides, causing friction and surface fractures. The moon is unusually massive compared to its planet, about one-eighth of Pluto's mass, a solar system record. It is thought to have formed much closer to Pluto, after a giant impact ejected material off the planet's surface. The material went into orbit around Pluto and coalesced under its own gravity to form Charon and several smaller moons. 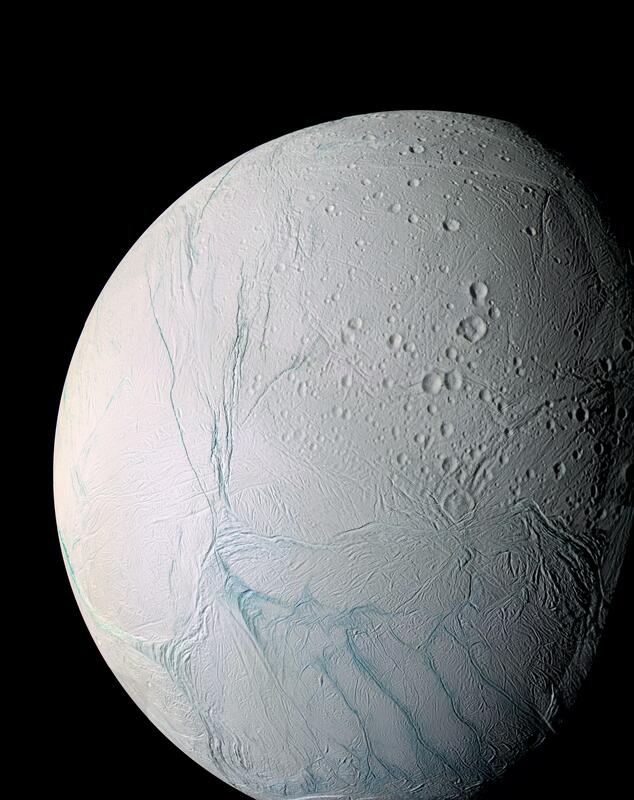 This is a close-up view of the fractures on Enceladus taken by Cassini during its flyby Nov. 21, 2009. The area, about 504 kilometers (313 miles) across, focuses on Baghdad Sulcus, a fracture in the south polar region. Initially, there would have been strong tides on both worlds as gravity between Pluto and Charon caused their surfaces to bulge toward each other, generating friction in their interiors. This friction would have also caused the tides to slightly lag behind their orbital positions. The lag would act like a brake on Pluto, causing its rotation to slow while transferring that rotational energy to Charon, making it speed up and move farther away from Pluto. "Depending on exactly how Charon's orbit evolved, particularly if it went through a high-eccentricity phase, there may have been enough heat from tidal deformation to maintain liquid water beneath the surface of Charon for some time," said Rhoden. "Using plausible interior structure models that include an ocean, we found it wouldn't have taken much eccentricity (less than 0.01) to generate surface fractures like we are seeing on Europa." "Since it's so easy to get fractures, if we get to Charon and there are none, it puts a very strong constraint on how high the eccentricity could have been and how warm the interior ever could have been," adds Rhoden. "This research gives us a head start on the New Horizons arrival – what should we look for and what can we learn from it. We're going to Pluto and Pluto is fascinating, but Charon is also going to be fascinating." Based on observations from telescopes, Charon's orbit is now in a stable end state: a circular orbit with the rotation of both Pluto and Charon slowed to the point where they always show the same side to each other. Its current orbit is not expected to generate significant tides, so any ancient underground ocean may be frozen by now, according to Rhoden. 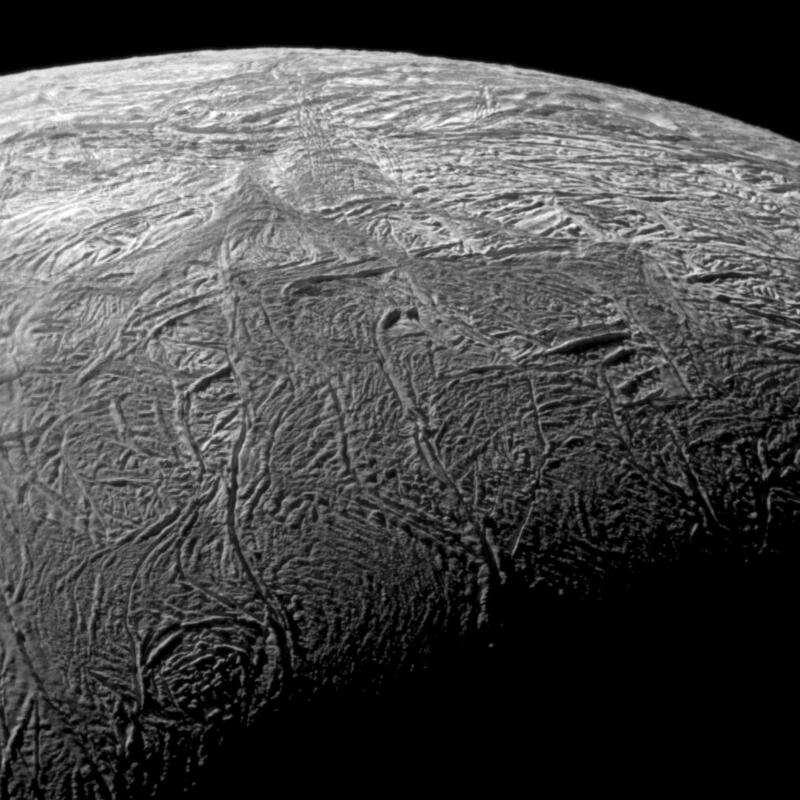 Since liquid water is a necessary ingredient for known forms of life, the oceans of Europa and Enceladus are considered to be places where extraterrestrial life might be found. However, life also requires a useable energy source and an ample supply of many key elements, such as carbon, nitrogen, and phosphorus. It is unknown if those oceans harbor these additional ingredients, or if they have existed long enough for life to form. The same questions would apply to any ancient ocean that may have existed beneath the icy crust of Charon. This research was funded by the NASA Postdoctoral Program at the NASA Goddard Space Flight Center, administered by Oak Ridge Associated Universities, and NASA Headquarters through the Science Innovation Fund.